This month started out with flapjacks! I added some chocolate covered cranberries I had picked up at Home Sense. I love that store. It’s dangerous every time I go in there because I always come out with something. They have you backed into a corner because if you find something you like, the chances of them being there when you go back can be slim to none! Then Sainsbury’s set me their panna cotta mix to try out. I decided to infuse the milk and double cream with black pepper and topped it with caramelized peaches and a drizzle of caramel sauce. It was delicious and inspired by an ice cream I had at an innocent (smoothie) event I attended a couple years ago. For Valentine’s Day I made a no-bake Chocolate Cherry Tart! It was rich and delicious… one thin slice is all anyone could manage in one sitting. So no one had to worry about pits I used a Cherry Pitter from OXO Good Grips that they sent me to use. Other things that inspire me are books!! 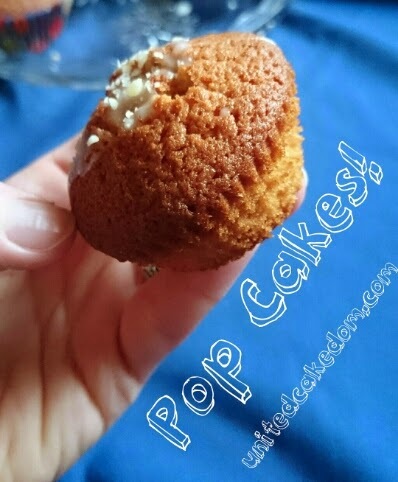 This month I made Silky’s Pop Cakes inspired by The Enchanted Wood by Enid Blyton. My girls really enjoyed eating something they read about from the book we've been reading before bed. Speaking of my girls my littlest one turned 5 in the middle of the month and she requested a turquoise butterfly cake. I did my best and she was happy with the result! February is full of birthdays including my friend Cathy who turned 30! She has a love of Lucky Charms and so as a special birthday treat I made her Lucky Charm Bark! I think she was pretty happy with it! I tried some too and it was pretty tasty, but mostly I loved the colors! And last but not least I wrote my first Five on Friday in months! I hope to be better at keeping it up and it becomes a regular thing. I brought it back with five pans and tools that I bought, but have yet to use! I get all these great ideas and I buy things I NEED to make said great idea. However, things don’t always go to plan! Does this happen to you too? That’s all for February!! March is going to be a bit book heavy as I've been doing a lot of reading! There are reviews and cake and brownies and much more!